This cleverly whimsical ballet, reflecting the essence of Lewis Carroll’s masterpiece, provides stage magic for the whole family. You don’t need any experience of ballet to appreciate the various vignettes, including the Adagio for the Queen of Hearts and four playing cards in Act III, a wicked take on the Rose Adagio from Sleeping Beauty. Itziar Mendizabal as the Queen played it to perfection, inspiring the audience to their biggest applause of the evening. Yet the main applause must go to the pure refinement of Sarah Lamb’s Alice, who takes all the strange happenings with perfect equanimity. It all starts with a garden party, and when Lewis Carroll takes a flash photograph of her, the lighting changes dramatically, throwing the guests into an otherworldly aura, while Ricardo Cervera as Carroll opens a hole in the ground, and assuming the persona of the White Rabbit takes Alice into Wonderland. The other characters from the garden party reappear in various roles, with Federico Bonelli as Alice’s beloved Jack turning into the Knave of Hearts. Act I is full of clever stage effects and video projections, and when Alice sticks her head through the little door to peep into the world beyond, colourful dancers suddenly appear in the audience. Act II contains one magical incident after another including the Cheshire Cat that decomposes and eventually reconstitutes itself as a single large face, the Mad Hatter’s Tea Party, the mushroom with a Caterpillar that later scurries off stage on multiple feet en pointe, and much more. Alexander Campbell, Thomas Whitehead and James Wilkie were superb as the Hatter, March Hare and Dormouse, and Gary Avis and Kristen McNally were terrific as the Duchess and the Cook in Act I, reappearing in an aggressive pas-de-deux in Act III. Sarah Lamb was lovely in her final pas-de-deux with Bonelli in Act III, and the Company performed with precision and vivacity. 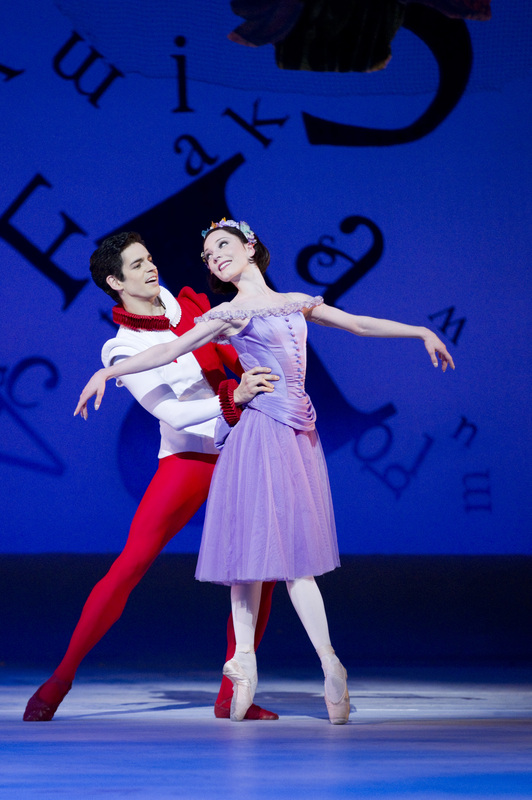 Yes, it’s all nonsense, very different from the ethereal magic of Sleeping Beauty, but Christopher Wheeldon and his designer Bob Crowley have recognised the very different magic of Lewis Carroll, and created something fun for dancers and audience alike. 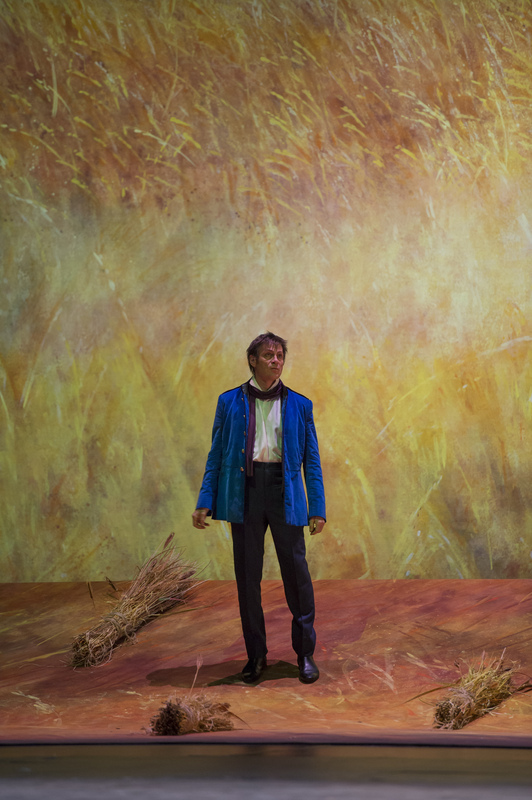 Joby Talbot’s music, orchestrated jointly with Christopher Austin, is full of the atmosphere of a warm summer’s day at the right moments, as well as the staccato confusion of the characters in Alice’s dream, and this co-production with the National Ballet of Canada was very well conducted by David Briskin from that company. Performances with various casts continue until April 13, with two Saturday matinees. All are sold out, but there is a live cinema screening on March 28 — for details click here. Two completely new ballets, plus one staple from the Balanchine repertoire, made a very well judged triple bill. Alexei Ratmansky’s dances to Chopin’s 24 Preludes were sandwiched between the ethereal Apollo, and Christopher Wheeldon’s powerful new creation to Benjamin Britten’s Sinfonia da Requiem. More on that later, but first to Apollo. Patricia Neary’s staging goes back to Balanchine’s original including the prologue, and Carlos Acosta was an Apollonian character of huge power. The three muses performed with great precision, Marianela Nuñez making a wonderful Terpsichore with her lyre. 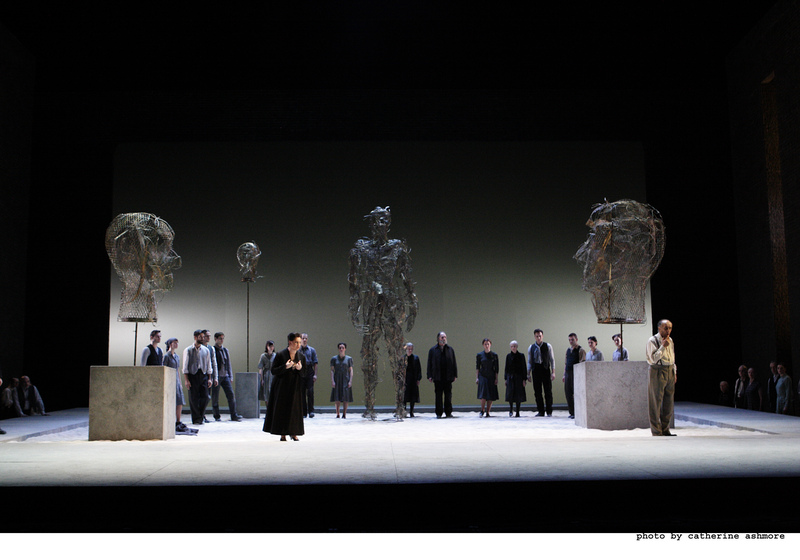 Calliope with her scroll of paper was portrayed by Olivia Cowley, and Polyhymnia in a mask, holding a finger to her mouth to represent silent mime, was a very musically expressive Itziar Mendizabal. Following the serenity of Apollo, Ratmansky’s 24 Preludes made a complete contrast with its effervescent choreography. Chopin’s Preludes are composed in all 24 different keys (12 major alternating with 12 minor) and in these 24 pieces there were solos, duets, trios, and more, ending with all eight dancers in D minor. Lovely costume designs by Colleen Atwood: girls in flowing dresses, two silvery-blue, two purple, and the four boys in silvery tops and black tights. Neil Austin’s lighting design for the backdrop involved subtle changes throughout, and Chopin’s music sounded intriguingly contrarian in a version orchestrated by French composer Jean Françaix. A superb performance by eight of the Company’s star performers. Finally came Wheeldon’s Aeternum to music that represents the peak of Britten’s early orchestral writing. It was originally commissioned by the Japanese government for the 2,600th anniversary of Emperor Jimmu in 1940, and although they initially accepted Britten’s idea it was later rejected as completely unsuitable. The three movements are: Lacrymosa (a slow marching lament), Dies irae (a sort of dance of death) and Requiem aeternam (the final resolution), and as an expression of pacifism it was a reaction against dark political developments abroad in the world. 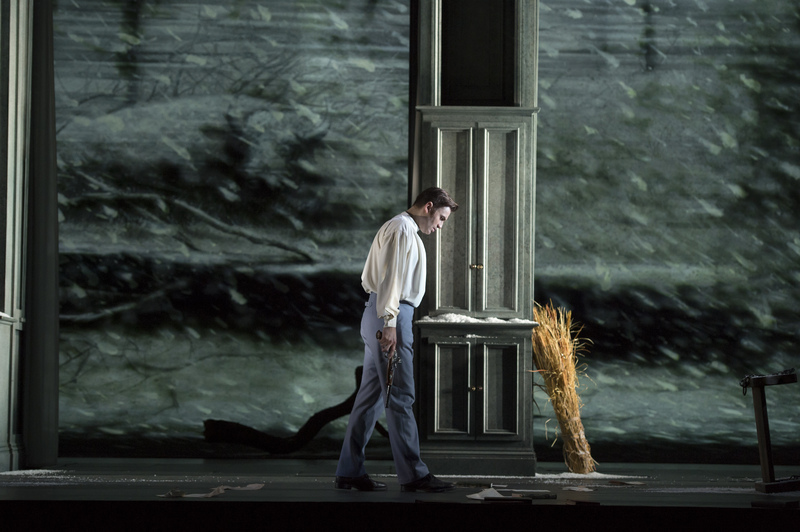 Wheeldon’s powerful choreography was complemented by a hugely impressive three-dimensional backdrop by Jean-Marc Puissant, cleverly lit by Adam Silverman. At the start of Part I and end of Part II a body lies on the stage, but in Part III all is clear with the backdrop lifted, and just before the final curtain two silhouettes walk away from the audience. 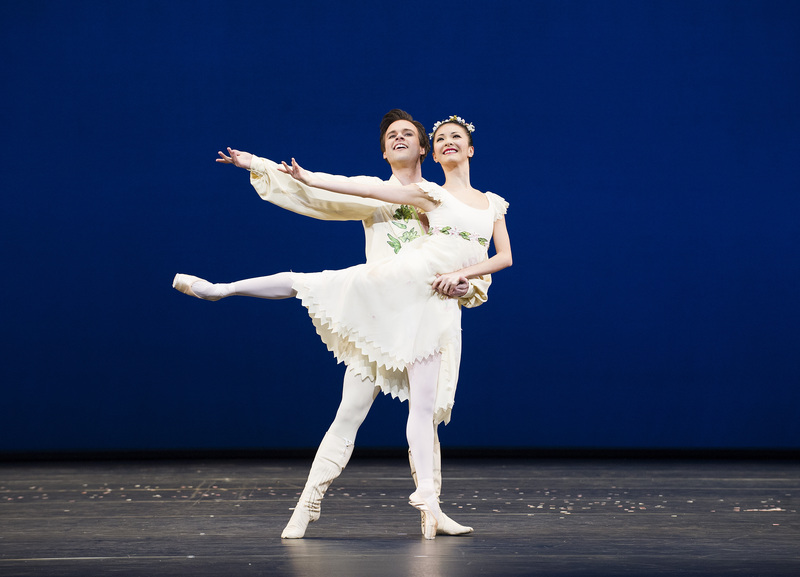 In the meantime Marianela Nuñez and Nehemiah Kish were wonderful together in Part I, James Hay performed a fine solo in Part II, and Nuñez and Bonelli were beautifully expressive in their Part III pas-de-deux. This intriguing ballet demands a second view, but all performances are sold out. Here is one of the perils of success. The Royal Ballet has shown itself to be so good at putting on mixed bills, yet there are only five performances. Preparing new works like these is such a huge job, and although standard three-act ballets sell more performances and at higher prices, there really should be more chance for audiences to see this wonderful new material. Performances continue until March 14 — for details click here. This review is for the cast on the second night, and what a treat it was again to have Emmanuel Plasson as maestro for this delightful mixed bill of short Aston pieces. As a serious conductor who is happy to perform ballet music he showed a sure touch with orchestra, instrumental soloists and dancers. Musically, Plasson is ideal for a French work such as Ravel’s La Valse, and under his direction the dancers produced elegant flowing movements to Ashton’s choreography. Plenty of attack from the men, and Tara-Brigitte Bhavnani and Valeri Hristov made a superb central couple. In the ‘Meditation’ from Thaïs Sarah Lamb, beautifully partnered by Rupert Pennefather, showed exquisite arm, head and body movements. The lifts were serenely executed, and their poetry in motion was an example of how glorious this pas-de-deux can be. Then from the sublimeness of Massenet’s music, lovingly played on the violin by Vasko Vassilev, to the bounce of Johann Strauss’s Voices of Spring. This came through with wit and joy from Yuhui Choe and Alexander Campbell, who were both, if possible, even better than the previous night. After the interval, Satie’s Gnossiennes and Gymnopédies, which Ashton used for Monotones I and II, came over beautifully under Plasson’s direction, and Christina Arestis, Ryoichi Hirano and Nehemiah Kish were in excellent harmony in the heavenly Part II. Then to Marguerite and Armand where it was the turn of Zenaida Yanowsky and Federico Bonelli to perform the five tableaux from La Dame aux Camélias. There are those who say that since Ashton wrote this specifically for Fonteyn and Nureyev, no one else should perform it, but Yanowsky gave a very moving portrayal of the beautiful, consumptive Marguerite. Gliding with perfect grace, yet distracted by her fatal disease, she brought out the soul of this misunderstood young woman, with Bonelli showing the joy, tension and aggression that finally turns to quiet despair as she dies. Again an excellent portrayal of the father by Christopher Saunders, and very sensitive piano playing by Robert Clark. These Ashton pieces form an unmissable evening — call for returns on the day of the performances, which continue with various casts until February 23 — for details click here. This was Tamara Rojo’s evening, ending with a lovely bouquet of flowers for her — making up for their lack of such tributes in her last days with the Company, after accepting the artistic directorship of the ENB. In Ashton’s take on The Lady of the Camellias, she was a captivating Marguerite, glamorous and consumptive, showing fine textures of emotion. 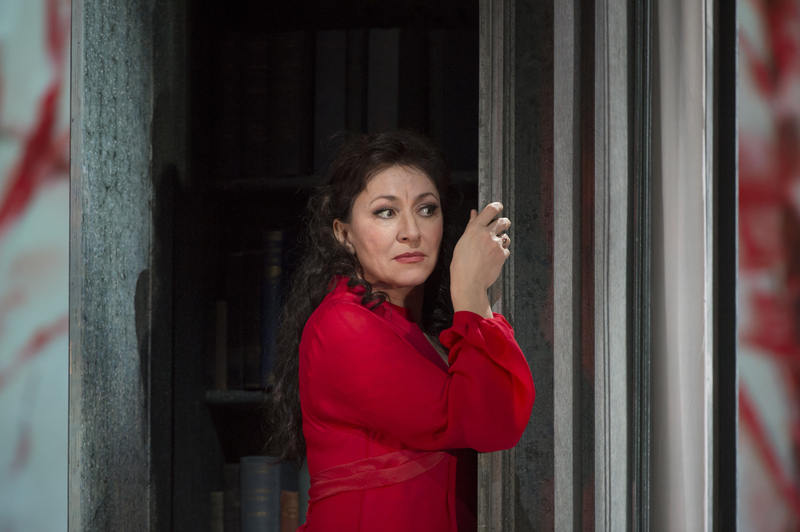 So lovely in her red dress in the second tableau, so apparently serene yet emotional in the third with Armand’s father, her broken bourrées heart wrenching in the fourth, and in the last tableau her demise left me spellbound. Her partner, Sergei Polunin also left the Company last season, but in a far more abrupt way, and it was good to see this extraordinarily talented dancer back again. Their pas-de-deux were flawlessly executed and full of the tension that Ashton brought to his choreography for this ballet. Polunin himself showed a deft and light touch as he entered in the first tableau. Secure in his dancing and dramatic in his portrayal he only perhaps lacked command at the odd point when he was no longer with her. 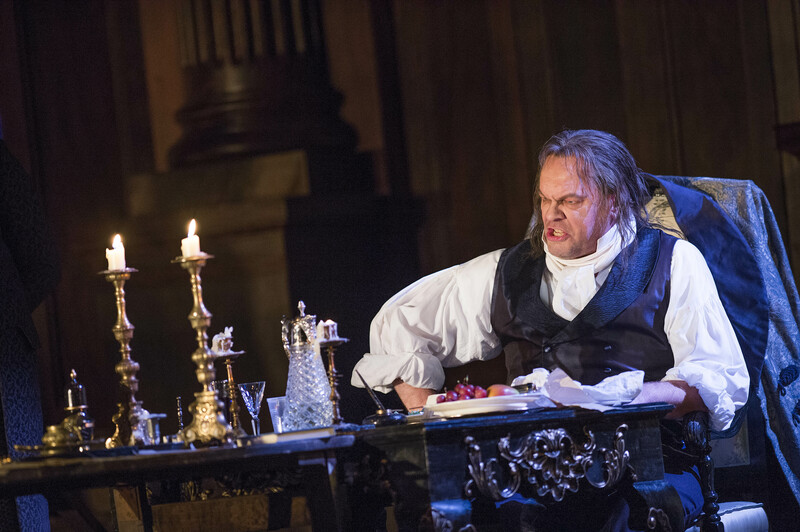 But this was a beautifully sensitive performance, and Christopher Saunders gave a fine portrayal of the father. It ended a thrilling evening of ballet preceded by Monotones I and II between the intervals. Superbly danced, and Marianela Nuñez, Federico Bonelli and Edward Watson formed a heavenly triple in Monotones II. Nuñez in particular brought an ethereal quality to her performance, with extraordinarily graceful arm movements as she developed them from one position to another. When geometry in motion has such quality it leaves the mere human realm, which of course is exactly what Ashton intended. Before the first interval was a short triple bill starting with Ravel’s eerie La Valse, which the Company danced beautifully, and ending with Johan Strauss’s enduringly happy Voices of Spring, gloriously performed by Yuhui Choe and Alexander Campbell. As they danced I couldn’t help but think of the dreadful stuff one sees in the New Year’s Day concert from Vienna, but there is of course no comparison. This is Ashton, and the brief middle item in the first part, his ‘Meditation’ from Thaïs, was magical, drawing a calmly riveting performance by Leanne Benjamin and Valeri Hristov. She floated in the air and his body movements exhibited huge strength and security. Musically too this was a treat. Vasko Vassilev played a wonderful violin for the Meditation, and Robert Clark a fine piano in the Liszt. But the main plaudits must go to Emmanuel Plasson for some of the best conducting I have heard for the Royal Ballet in recent years. His French background is perfect for the Ravel, and the Satie in Monotones, and to my taste he fully brought out the tension and lyricism in the Liszt for Marguerite and Armand. This is a sell-out, and as some seats can be bought for £6, better value cannot be had in London. Performances with various casts continue until February 23 — for details click here. 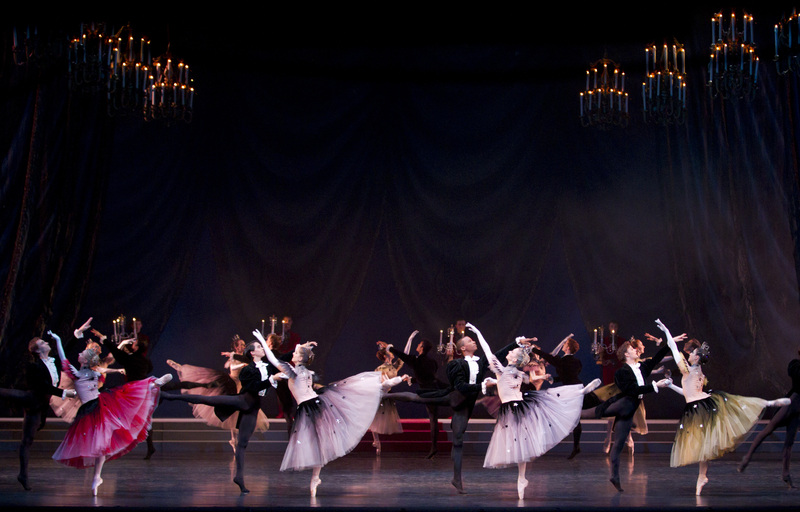 After John Cranko worked on the choreography for Tchaikovsky’s opera he wanted to turn the story into a ballet, which he later did in Stuttgart. Apparently he intended to use music from the opera, but the Stuttgart Ballet commissioned a score by Kurt-Heinz Stolze, using alternative music by Tchaikovsky. The resulting creation is rather different from the opera, which Covent Garden will perform in a couple of weeks’ time. Onegin here is a less nuanced character than the one based more firmly on Pushkin’s original in the opera. Here in the ballet he tears up Tatiana’s letter in Act II when she refuses to take it back, and his flirtation with Olga is cruel rather than showing her fiancé and his friend Lensky what a silly vacuous girl she is. But the choreography is glorious and the poetic justice of Tatiana tearing up Onegin’s letter at the end of Act III is very effective. Within this context, Federico Bonelli gave a fine portrayal of Onegin, showing coolness rather than anger as he rips up the letter, and avoiding an excess of nastiness as he dances with Olga at the Act II party. The main character in the ballet however is Tatiana, and Laura Morera showed a lovely dreaminess in Act I particularly in her pas-de-deux with the imaginary Onegin who appears through the mirror, followed by emotional wildness in Act II after Onegin dances with Olga, and serenity in Act III as her pas-de-deux with her husband Prince Gremin flowed with life and joy. Gary Avis as Gremin was superb, his fine stage presence at the party turning to a beautiful expression of love for Tatiana in their duet together, and perplexed concern with what bothers her later in her boudoir. Bonelli, who has shown admirable angst at Gremin’s party when he realises who Gremin’s wife really is, then comes in to face Morera, and their pas-de-deux was quite rightly the high point of the evening. Finally she rejects him with a fine mixture of assertiveness and regret. Avis, Morera, and Bonelli brought the performance to a glorious conclusion in Act III, while Yuhui Choe as Olga was sheer delight, and after an uncertain start in Act I, Nehemiah Kish as Lensky came into his own in Act II showing excellent anger and forcefulness in challenging Onegin to a duel. 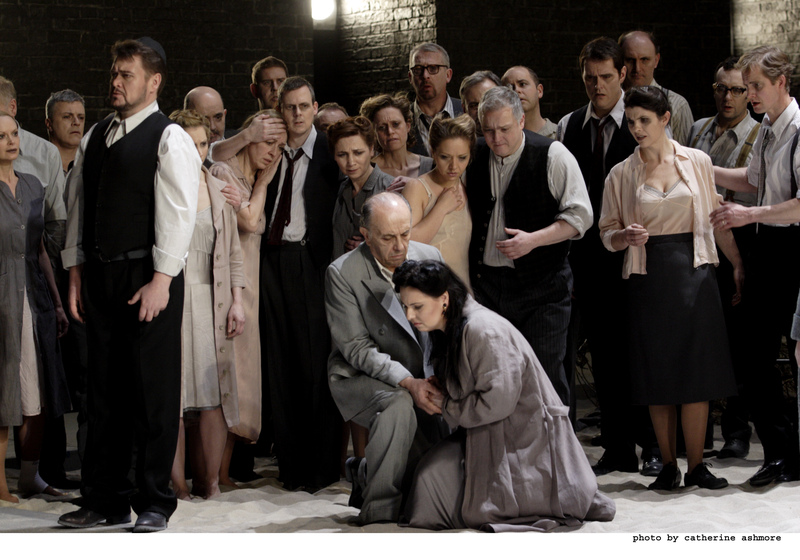 Lovely work from the whole company, and Dominic Grier in the orchestra pit gave an excellent account of the score. The designs by Jürgen Rose, based on the Stuttgart Ballet originals from 1969 are wonderful, and I shall report again tomorrow after seeing a different cast this evening. Performances with various casts continue until February 8 — for details click here. 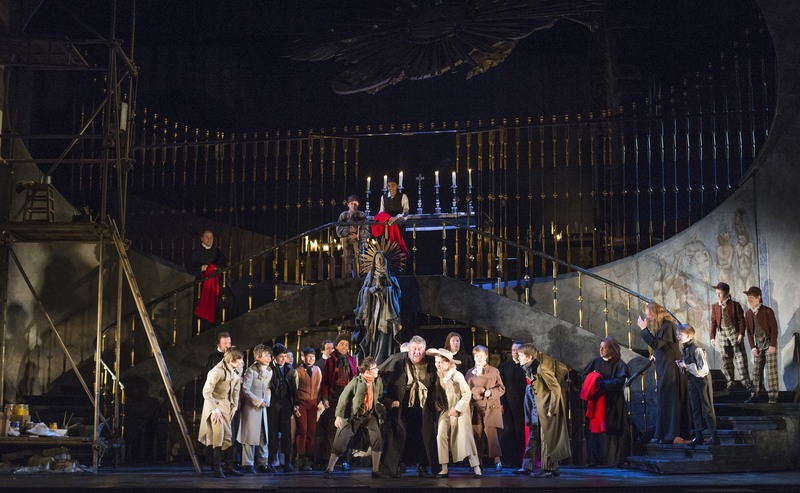 What a terrific triple bill this is, and on the evening of 29 December it was beautifully danced. 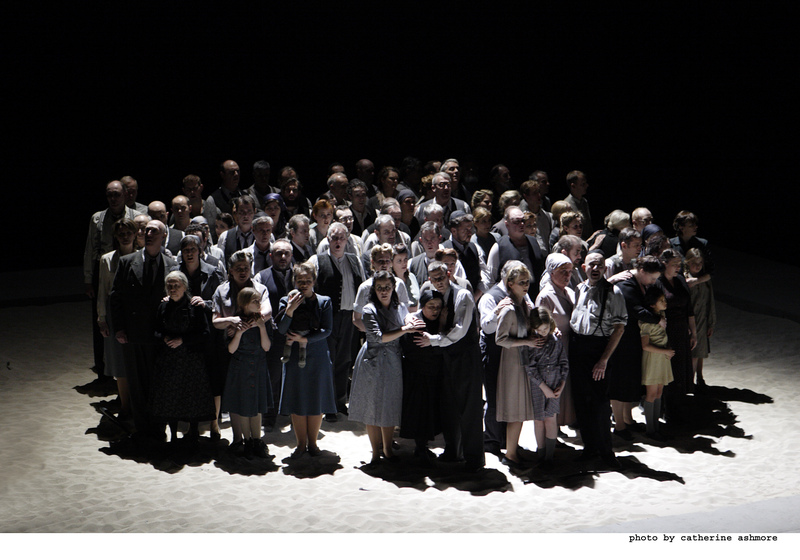 Among cast changes in Raymonda, Zenaida Yanowsky and Ryoichi Hirano replaced Nuñez and Pennefather in the main roles, and Ricardo Cervera replaced Whitehead in the Hungarian dance. Cervera showed a fine cutting edge and dramatic sense, and his partnership with Kristin McNally worked like a charm, the two of them looking like dolls together in perfect time to the music. The dancers in the female variations, the same as before, were even better if that is possible. Hikaru Kobayashi showed beautiful control and musicality, Yuhui Choe’s arabesques en pointe with a bending of the leg were extraordinary, Itziar Mendizabal was lovely in the slow variation, and Helen Crawford’s jumps in the fourth variation were a thrill to watch. 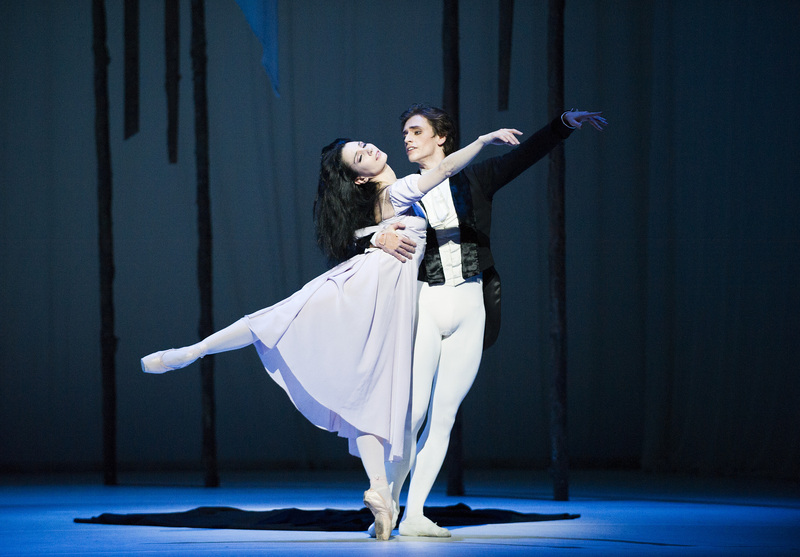 As a ballet Raymonda has a rather silly story, but the Act III wedding of its eponymous heroine with Jean de Brienne, recently returned from the crusades, is a feast of dancing, and Yanowsky and Hirano were outstanding in these roles. I can’t resist a quick mention of Fumi Kaneko, Emma Maguire and Yasmine Nagdhi who were brilliantly on the music in the pas-de-trois. Raymonda Act III makes a glorious finale, and as the curtain opened Barry Kay’s ravishing set once again elicited spontaneous applause. Firebird, so often the finale itself, is the starter here, with Mara Galeazzi showing beautiful arm movements as the Firebird. Edward Watson gave a well-nuanced performance as Ivan Tsarevich, Alastair Marriott was suitably dramatic as the wicked Kostcheï, and Christina Arestis was a gorgeous princess. The story is the reverse of Swan Lake, the prince abandoning his passion for an exotic female to accept a royal and more appropriate partner, but Stravinsky’s music is, or should be, hugely dramatic, though Barry Wordsworth’s conducting with its elegantly rounded corners lacked energy and bite. No problem on that score with the second item, In the Night, where Robert Clark gave an excellent performance of Chopin’s nocturnes to accompany some glorious choreography by Jerome Robbins. Against a starlit background, Alexander Campbell and Emma Maguire made a wonderful first couple, he so full of energy, she showing a gentle gracefulness. And in the third variation, Carlos Acosta and Roberta Marquez made a dramatic entrance on their shaft of light, moving apart and together with great passion. It was a super partnership, but in the second movement Zenaida Yanowsky and Nehemiah Kish did not manage the same success as a week ago. She seemed far less comfortable than with Hirano in Raymonda, and a couple of the lifts went slightly awry. In the Night ends with a delightful waltz, and interactions between the six dancers — it is a superb vehicle for the individual brilliance that this Company has in spades, and they should dance it more often. Unfortunately all three later performances are sold out, but click here for details and possible returns.